Byblos was an early Phoenician settlement, associated with the history of the diffusion of the Phoenician alphabet. It was a maritime commercial city with strong trade relations to Egypt. Phoenician remains on site include the Great Temple built in 2700 BC, the Temple of Baalat Gebal built in 2700 BC and the Temple of the Obelisks built ca. 1600 BC. The town is believed to have been founded around 5,000 BC, making it one of the oldest continuously inhabited sites in the world. It was turned into a structured city with walls in about 2,800 BC. Byblos is located on the Mediterranean coast of present-day Lebanon. It is attractive to archaeologists because of the successive layers of debris resulting from centuries of human habitation: neolithic, chalcolithic, Assyrian, Roman, muslim and Crusaders. Although Byblos (nowadays known as ‘Jbeil’) lies only 35 km north of Beirut, it took the rickety local bus number 6 more than 1.5 hours to get me there. As always in Beirut we got stuck in traffic, and then slowly proceeded through casino-town Jounieh until we reached the Mediterranean. Finally we were leaving the highrise buildings and American fastfood restaurants behind. The drive northwards along the coast is quite pleasant, though many good spots have been taken over by large beach hotels and exclusive fish restaurants. The bus driver dumped me at an overpass, from where I walked down into the city center of Byblos. It is not difficult to find your way to the archeological site: just walk to the Crusader Castle, which is the highest building in the area. After paying the ´foreigners´ entrance fee of 8000 LBP (4 EUR), I started the long circuit of the complex. Paths lead to all corners of the site, with information boards in English, French and Arabic to explain what once was here. The origins of Byblos lie in the neolotihic and chalcolithic, so remains of this period are limited. Better preserved is the Roman heritage: a small theatre at a splendid location overlooking the sea, and a row of columns along a former Roman road. At the far end of the complex lies the Temple of the Obelisks, an Egyptian/Phoenician construction. A group of obelisks still is standing upright, which makes it look like a cemetery. 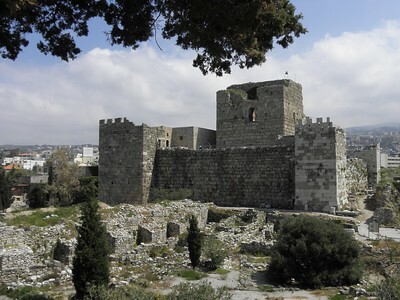 My walk ended at the Castle – the first Crusader Castle I have ever been to. I admired its sturdy construction. Inside a museum covers two of its floors. The best pieces that were found in Byblos are shown in the Lebanese National Museum however: the sarcophagus with the first Phoenician writing, the colossal Egyptian-looking Bronze Age statue that dominates the main hall, the little delicate, flat bronze statues that were used as votive offerings. I spent about 1.5 hours on site, and enjoyed walking around it slowly. It was the busiest tourist site I have visited so far in Lebanon: there were about 30-40 other people, most of them in small tour groups. Before taking the bus back to Beirut, I had another good Lebanese lunch at Fenicia restaurant near the souk. Byblos is one of the towns that, along with likes of Jericho, Damascus, Plovdiv and Athens claim to be the oldest continously inhabited cities of the world. As far as Lebanon goes, it's the easiest one to visit, a chilled under-an-hour drive up north from Beirut. Well, as long as you won't get stuck in traffic jams, that are especially painful in the evenings (we enjoyed them on our way back). The town is very touristy and milking its potential to the last drop. There's a free parking spot that's well signposted, or, if you fancy yourself very lazy, you can make use of the vallet parking right by the entrance, we spent about 3 euros on that. The site itself is pretty, but a bit of a mishmash of everything: a crusader castle with lovely views from the top and then Roman ruins. Including one of the smallest theatres I've seen. The site is quite extensive, you can choose which parts to explore. There are signposts in multiple languages around. The castle doubles as the museum with some excavated exhibits. It's the most touristy of Lebanese WHSs, many people around, so visit early to beat the crowds. We visited en route from Qadisha valley, used the offline maps as the highway exit and the whole road is not that well signposted. Oh and if you want to stock up on souvenirs, this is the place to do so. Byblos is apparently/claims to be the “oldest continuously inhabited town in the world”. The “idea” is however more impressive than the reality. 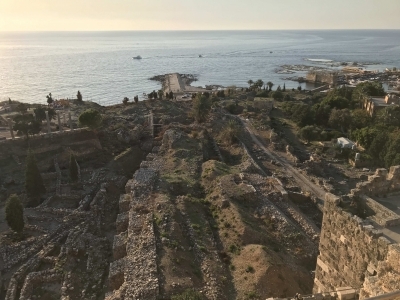 It is a pleasant enough town with bustling little harbour overlooked by the remains of a crusader castle (photo) – much like many a small town around the Mediterranean. On the hill by the castle there is an archaeological site with a range of ruins from Roman times going back to Bronze Age and Neolithic but in all honesty there is not a lot to see. If you have made it to Lebanon however you should go up there – it is an easy trip out of Beirut either as part of a circuit up to the Cedars of Lebanon or as a return trip. It is all very relaxed and there are some good restaurants and pleasant cafes. Horse Stables: The former Crusade cathedral was used as horse stables by the Arabs. Mentioned in the Bible: It is mentioned in the Bible in 1 Kings 5:18, referring to the nationality of the builders of Solomon's Temple, and also in Ezekiel 27:9, referring to the riches of Tyre.